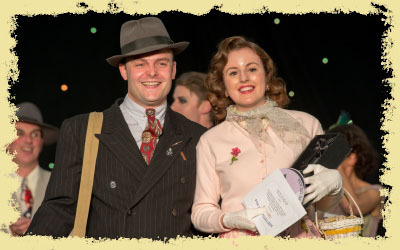 Celebrating the best in Vintage Style, the finals of Mr and Miss Vintage UK 2014 were held in the Colonial Club at Twinwood Festival in front of a packed audience. It was a fantastic show - and with such marvellous finalists this year, picking the winners was incredibly difficult! but we are pleased to congratulate Holly Foster as Miss Vintage UK 2014, and Thomas Peare-Harte as Mr Vintage UK 2014! 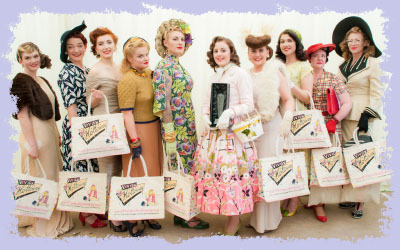 The fabulous finalists for Miss Vintage UK were: (from left to right): Charlotte Jones, Hannah O'Kelly, Joanna Sophia, Susie Ford, Lori Jade-Barker, Holly Foster, Sharon Scoffings, Laura Hollowell, Sally Sweetlove, and Melanie Calland. Sally Sweetlove took 4th place, with Laura Hollowell in 3rd place and Melanie Calland in 2nd place, with Holly Foster as the overall winner! 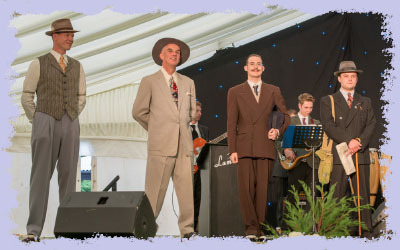 For the dashing Mr Vintage UK - (from left to right): Dave Phillips, Frankie Calland, Ian Valentine, Thomas Peare-Harte. Dave Phillips and Ian Valentine shared joint 3rd place, with Frankie Calland coming in 2nd, and Thomas Peare-Harte taking first place! Congratulations to all of our finalists - you were all truly wonderful! A big thanks to the hosts of the show, Marcella Puppini, Dusty Limits, Lola Lamour and Marc Ewing, and also judging were Rachel Egglestone-Evans and Elin Holloway.